Basilem's review"Very good multi-track recorder"
I've had the R16 for 2 years and use it in my home studio, as a multi-track field recorder (radio deck, conferences) and a soundcard. That's its main strength: It's a multi-task device that allows you to work without a PC. I think it complements perfectly a pocket recorder, like the microtrack II. While it's very light, it's also very fragile. I think there's not much to add regarding its usability and functions. I didn't have the stuck plugs problem, but I did have the one regarding tracks that produce loud noises (hiss) at the input. The problem goes more or less away if you let the unit warm up. Apparently, it's a problem with the electronic components of the preamp. I'm not a big fan of the control surface function, which is somewhat of a trifle. It's perfect to record a public conference: Up to 8 speakers simultaneously and you can mix live to send it to the stereo master and the PA via the jack outputs. Another good point is that it supports SDHC cards of up to 32GB, so there are no recording capacity issues, even with 8 tracks. The drivers are up to date for windows 8.1, so it's still a relevant product in 2014. However, there's no news for Linux, the hardware isn't generic, so it isn't recognized as a sound card (however the R16 is perfectly recognized as a player, so you can import your recordings and mix them with Ardour). As a multi-track soundcard, it works fine with Cubase 6LE (included) and also with my old Sonar 5, while Audacity and RadioDJ recognize it as a 2-track soundcard. In short, it's a good value for money, but be careful if you get it secondhand, first check that everything works fine. I don't think I'd buy it again now: I think I'd go for a more modern unit (and not the R24, which doesn't add many things). Nevertheless, a secondhand R16 in good shape is a good deal. Jean-Seb G's review"Too much or not enough"
I've been using it for one year now and haven't had any hardware problems. After having tested the H2, H2N and H4N models, I opted for the r16. What I like best about this product is its portability and what I like least is its non-portability. It is in fact very limited in terms of capacity but it works fine as a backup recorder or as a soundcard. However, as a backup recorder, an H4 is much more practical. My R16 doesn't fit in my pocket and takes up the same space as a computer. Its main advantage is that it's a cheap multi-input soundcard. In terms of value for money, I have no complaints. As I wrote above, not-expensive multi-inputs, it's a given. In my experience, I don't think I'd buy it again. I'd buy a non-portable (but transportable) audio interface and a really portable H4. The product is very good, but it's somewhere in the middle of the road, so you'll need to know what you want to do with it and for how long before you need something bigger or smaller. Cadadri's review"Okay for the price, but watch your jacks"
Something about this is special. I believe it may have something to do with the fact that the Zoom R16 is sort of a hybrid device. It can in fact function fully as an audio interface, but it shines in its ability to do digital recordings anywhere with either its two built in microphones or up to 8 microphones plugged in. It bridges a gap that quite frankly needs to be bridged between the audio interface and the potable digital recorder. It is nothing that should be considered particularly interesting, but its very existence in the realm of options is certainly something to thank. The best part about the Zoom R16 is the fact that despite the fact that it could be an interface, the latency can pretty much be a non issue since you can record straight to the device. Its integration with computers is a little finicky and latency is not the best when you use it as a straight up interface, but in truth, it is not the main draw of the device. Its ability for the faders to be used to mess with automation is a huge plug. It is a huge joy to have many many features consolidated into one small, inexpensive device. There is not really a getting started issue to this. It is a digital recorder, and while Zoom's menu systems take a bit of getting used to, the operation becomes incredibly smooth once you have the hang of things. My only hangup on this unit is that its preamps are not the most interesting things in the world. They do not drive a whole lot of gain to anything, so more esoteric microphones are not an option when it comes to the Zoom R16. However, it fills its role perfectly. 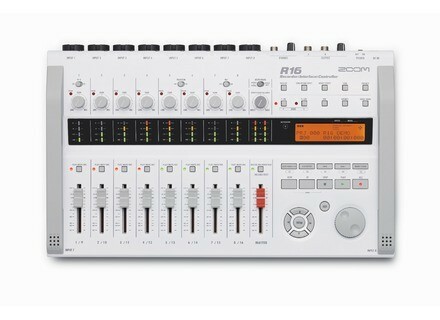 It knows exactly what it is, and everything that Zoom sets out to do with the R16 it does very well, and very smoothly. The R16 is a fantastic option if you are looking for something that can act as an interface and still portably record large setups on the fly. cytoyen-971's review (This content has been automatically translated from French)" Almost all good!" I just bought this little gem Audiofanzine on, of course, it is great! with SD-HC 16GB card, I have time to have fun and to use it also with playback tracks for my guitaristic evenings. The eight inputs have not served me, I'm all alone behind my table, but the 16 tracks, it's too good, it is at ease to mix several guitars when it has a only! A small effect here, a panoramic there, and it's Gipsys in the box. Soulei's review (This content has been automatically translated from French)" Amazing for the price!" We bought the Zoom R16 to record our rehearsals multi-track WITHOUT COMPUTER. Low (amp out), guitar (amp out), battery (2 + 1 C414 Beta52), keyboard (line out), microphones (SM58) ... everything goes. It is very light (plastic) very portable, buy the bag sold is useful for protection during transport. The stereo output on the console of our rehearsal studio on branch (to amplify the voice) and records everything you want with the system, without having to disconnect any cables. At the sound, so that bin does not gain beyond 3/4, it is very clean, no staining, the momentum is maintained. Frankly for models is more than enough. Once the registration is, we can send some tracks on the layer 8-16 to re-record up to 8 tracks and more (so 16 in total!) Which allows a lot of flexibility. The headphone output with adjustable click is a real plus to save itself (I am a drummer I know what I mean ). Once the rehearsal ended, I bring home the machine and I used audio interface (44.1 / 16 bit) in Reaper for multitrack work. Again it is clean, smooth, efficient. One can even use the faders to control the DAW, but as they do not the motor is not necessarily practical. The next step in my use of R16 is reading samples through the machine, I'd previously edited in Reaper and imported into the SD card R16. If some still raise the question of the quality of the preamps, I used the R16 with Schoeps capsules CCM4, I can tell you that quality is at the rendezvous. Basically, if your mics are qualitative and that you are using, the R16 will amaze you can be sure! Finally, I would say for about € 300, it does not get better in 2013! CT-64140's review (This content has been automatically translated from French)" Formidable!" I use this recorder as part of a duo. Within this duo, each has its Zoom R16. These recorders we use to prepare 100% backtracks "homemade" above which we play on stage. By connecting the two zoom together, we get a multi-set of 16 simultaneous tracks, + 16 additional tracks "recording". - Manual poorly done! Discouraged I decided not to use certain functions - including insert effects. - The handling of the EQ settings on the LCD display is average. - In general, the work on the Zoom requires great attention because of multifunction buttons, cascading menus, etc.. Handle in peace! - The XLR jacks on the rear panel and are very difficult to remove. So much so that we had to equip a two zooms ("harder" than the other) adapter to more easily disconnect microphones or cables sending signals. - In the case of use of files on the SD card to a computer, a model who underwent the Zoom track deletions and numerous manipulations, we arrive at a "hodgepodge" important, the files stored on the card are numbered by order of recording the tracks cleared of zoom are always on the card (to be restored with "undo" it finds herself with a jungle of files that must be identified). AU After a while, it was a jungle of files! The possibility, the Zoom itself, naming tracks would have been welcome. - I have, in a few cases, been confronted with "bugs" (tracks disappear for example, or that are not read) it has always been possible to solve it by creating a new project and assigning the slopes the new project files created previously. Some bugs (and that the two zooms are used) sometimes also on listening to a track on which punch in are carried out: during this operation, the sound that comes before or after pins input / output transition to re-register should be heard, which is not always the case! This bug often and the first time, you get scared because you think you deleted that is outside the marks, when off the punch in / out and listen, you realize that there is no problem! When this happens (the use of punch in / out making inaudible the whole track even without marks), shutdown and reboot Zoom solves the problem. - Once you understand the basics, usage is very simple. - Are made of excellent quality models! and not only ... I recently made a multitrack live recording in a concert of a pair of international reputation: 1 track song-1, 1-track song 2, 2 tracks for piano piano, one track atmosphere. Listening to the Master (mixed with cubase), artists have found that "marketable" quality. - I only use very little effect outside of the reverb. It not seem that bad. In any case, in the context of use as I do, it seems more than enough. This lens is a really great camera considering its price. It may not totally agree not to those who have a Nobel Prize for Science Books, but I seem to be able to make recordings of really good quality (in certain listening conditions) seem to compete with "pro recordings ".